A heart-pounding, toe-curling, one-sitting serial killer thriller that will hook you from the first page till the last. Perfect for fans of Angela Marsons, Rachel Abbott and Karin Slaughter. 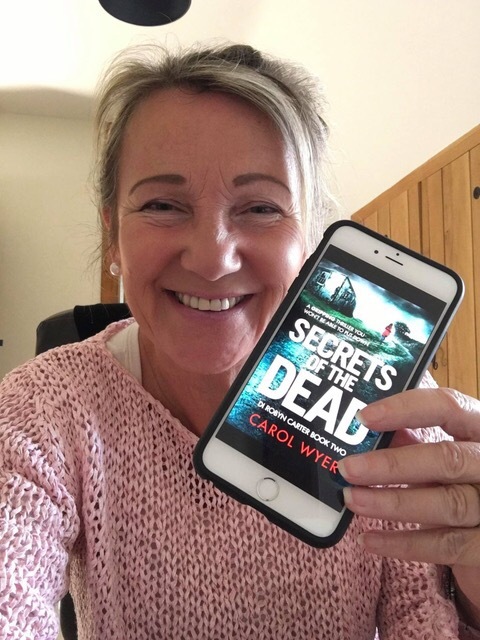 I’m thrilled to be helping to kick off the blog tour for Secrets of the Dead today and I want to wish Carol the happiest of publication days! 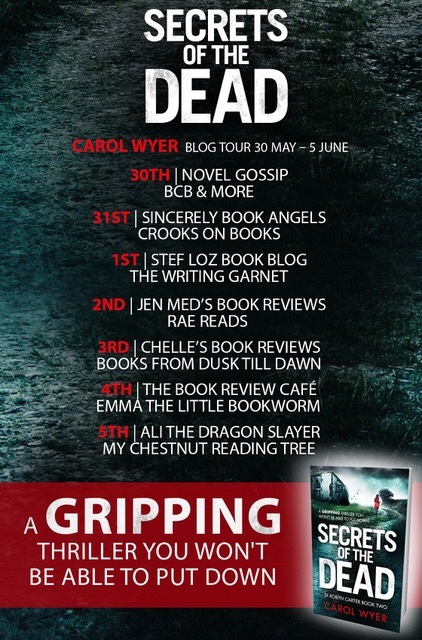 This is the second book in a series featuring Robyn Carter, I read Little Girl Lost at the beginning of the year and was blown away by Wyer’s debut as a thriller author. Not only is she an extremely talented romantic comedy writer, this second foray into a different genre has firmly cemented her place as a dominant force as a thriller author, what a multitalented woman. Robyn is still working as a DI and now that she’s found her groove again, she’s ready to keep climbing the ranks as she craves more responsibility and action. When she begins working a case where the victims are all found with a receipt that says, debts paid, she knows she is looking for a killer hell bent on revenge. I instantly connected with Robyn the first time around and this time as I learned more about her past, especially her time with Davies, I saw a softer, gentler side to her that appealed to me. The rest of her team is also interesting, I have a soft spot for Anna and Matt and the group dynamics were detailed more this time around. One of the things that impressed me so much in the first book was the way Wyer took so many unrelated plot threads and managed to merge them all together in a stunning way. 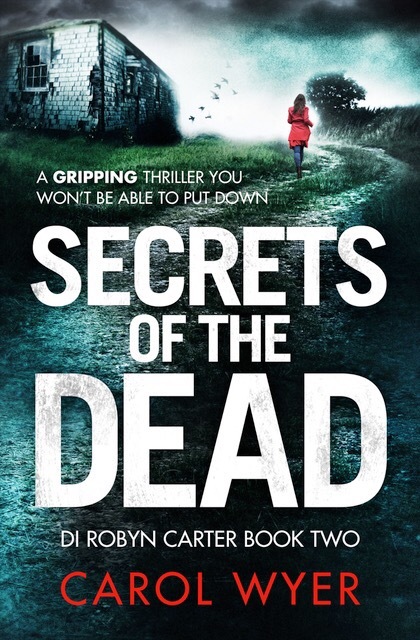 Secrets of the Dead was plotted in the same meticulous manner and featured a large, diverse cast of characters making it very difficult for me to pinpoint who the killer really was. It also had the same fast and furious pacing with short chapters of the kind that keep you turning pages long into the night. It stays mostly in the present day with only a smattering of chapters told from the killers perspective via flashbacks. This was clever as it drew me in even deeper, steadily stringing me along as I was so interested in finding out what this persons true motivations were. It kept me on my toes and gave the book an edgy, suspenseful vibe that I liked. Wyer raised the stakes with this book, Robyn is the type of strong lead character that can easily carry a series and the more I read about her, the more I like her. She believes in following her gut instincts and doesn’t back down even when no one else agrees with her and I admire a person who has strong convictions. This is another winner for me and Wyer just needs to write faster so I can keep reading more about Robyn and team. Really excited now to read this one soon.. I loved the first one as well and so good that she’s really plotted it in yet another stunning way. Really brilliant review Amy! Thanks so much Inge! I think you’ll enjoy this one as well. I just started reading Littke Girl Lost this morning. I am loving it. I look forward to reading this one too. Oh awesome, looking forward to seeing what you think! I just now realized I have a typo on Little. Oops. Oh my gosh! I loved it!!!!!! I immediately ordered a copy to be shipped to my mom. She will love it too! I started Secrets of the Dead today. Haha no worries! Probably because both of us have Novel in our blog names.